Eight people know who the killer is… and they’re all dead! 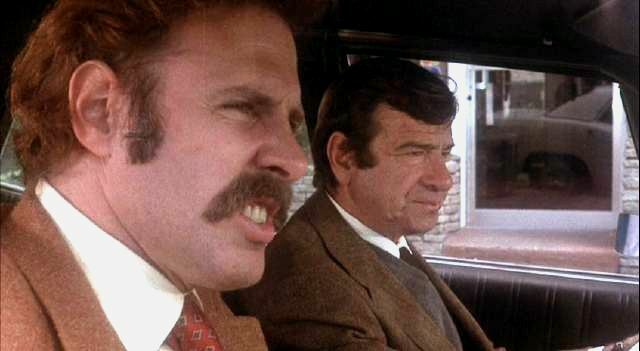 It’s a tough beat for San Francisco police lieutenant Jake Martin (Walter Matthau, The Taking of Pelham One Two Three) in the 1973 crime drama-thriller The Laughing Policeman. In the film, Martin has to investigate a city bus massacre in which a madman opened machine gunfire on eight people. It’s even worse when he discovers his former partner is one of the victims. But as Martin investigates the grisly murders, he not only discovers unsavory things about his partner, but he finds that many of the victims had shady lives, which shrouds the killer’s identity even more. Veteran Hollywood filmmaker Stuart Rosenberg (WUSA) directed this movie with a cast that includes Bruce Dern (The Driver), Louis Gossett Jr. (Finders Keepers), Joanna Cassidy (Under Fire) and Paul Koslo (Breakheart Pass). Bonus features include an audio commentary by film historians Lee Pfeiffer, Eddy Friedfeld and Paul Scrabo, an interview with actor Paul Koslo, an animated image montage, and a trailer gallery.